Jean Paul Gaultier Classique Eau Fraiche Wonderwoman is a light, summer edition of the Classique fragrance. This year, the inspiration comes from DC Comics and the Classique bottle is transformed into Wonderwoman. 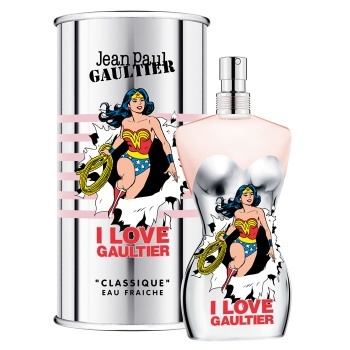 Jean Paul Gaultier Classique Eau Fraiche Wonderwoman is the same essence as the Betty Boop version last year. Jean Paul Gauliter Classique Wonder Woman Eau Fraîche opens with lemon sorbet, ginger and sugar cane juice. The heart includes Tiare flower, jasmine and orange blossom. The base consists of vanilla, musk and neo-labdanum for a lasting yet fresh essence that is very feminine and beautiful.